They look like lovely little treats from a fancy candy shop. But these Tuxedo Strawberries are easy to make at home with 3 ingredients and a few simple steps. Microwave white chocolate in microwaveable bowl on MEDIUM 2 to 3 min. or until chocolate is almost melted; stir until completely melted. Dip bottom half of each strawberry in white chocolate; place on waxed paper-covered rimmed baking sheet. Refrigerate 5 min. or until chocolate is firm. Repeat melting process with semi-sweet chocolate, using separate microwaveable bowl. Dip 1 side of each strawberry, at an angle, in semi-sweet chocolate. Repeat on opposite side of strawberry to create a "v" design as shown in photo, using a spoon if necessary to partially coat strawberry. Return to prepared pan. Refrigerate 5 min. or until chocolate is firm. Pour remaining semi-sweet chocolate into plastic bag. Poke hole in bottom of bag with toothpick. 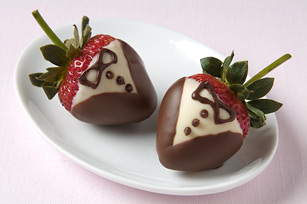 Use to make a bow-tie design on each strawberry, then add 3 small dots down front of strawberry for the buttons. Refrigerate 1 hour. See Tip for how to use leftover melted chocolate. Stir chopped nuts into remaining melted chocolate; spread onto waxed paper-covered baking sheet. Refrigerate until firm. Break into pieces. Store in tightly covered container in refrigerator for up to 3 days. Prepare as directed, substituting peeled kiwi slices and/or pineapple wedges for the strawberries. Use a paper towel to thoroughly dry the fruit before dipping in the melted chocolate. Use Tuxedo Strawberries as a garnish for your favourite cheesecake.